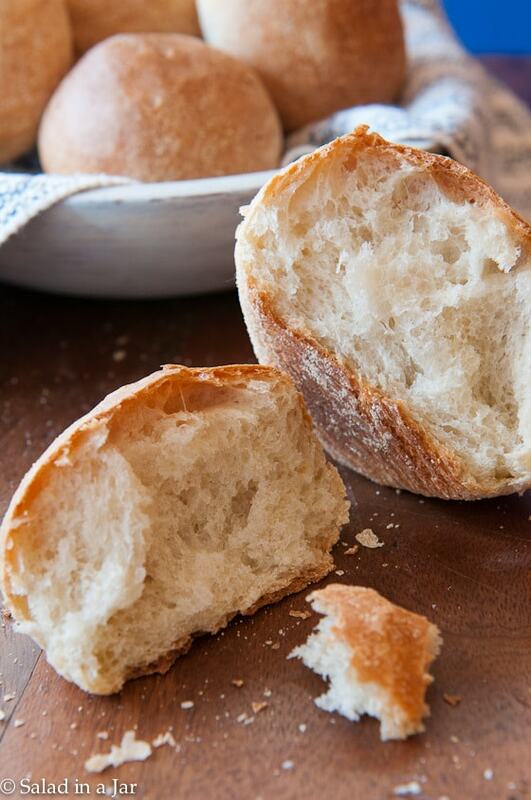 Use your bread machine to make these Really Crusty Bread Rolls with soft and chewy interiors. The secret is in the cornstarch glaze. You can still make these even if you don’t have a bread machine. Read the notes at the bottom of the recipe for details. 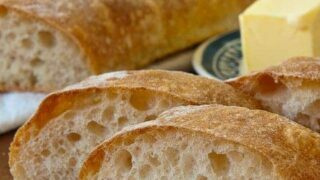 Who can resist a freshly-baked yeast roll with a thin, crisp, crackly, crumbly crust surrounding soft and chewy bread? Not me, for sure. Show me some marshmallow-soft salted butter, and I’m good for dinner. But, be warned. Really Crusty Bread Rolls can be messy. Crumbs may scatter everywhere as you slice or tear these rolls, but I have a solution. See the picture below for a special slotted cutting board designed to catch the crumbs? It also makes a convenient cooling rack and/or serving tray. The wooden box underneath the slats catches bread crumbs. The glaze is a cornstarch and water mixture, microwaved until thick, then cooled. For me, it’s easier than spraying water into my oven or using oven tiles or other special equipment to produce crusty bread. You’ll want to eat Crusty Bread Rolls hot out of the oven. Whatever you don’t eat the first go-round should get a quick trip back into the oven just before dinner to re-crisp. Bake about 5 minutes at 400 degrees Fahrenheit. Turn off the oven, and leave the rolls inside for another 5 minutes. Works great in a toaster oven, too, when you are only doing one or two rolls. Part Two: How to make bread bowls with this recipe. 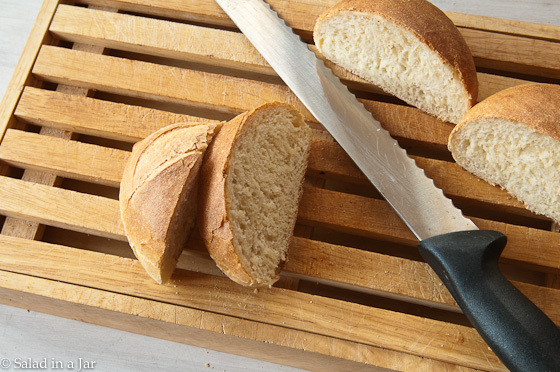 Crusty Round Bread (made in a bread machine); Two-step process slowly develops yeasty flavor resulting in a chewy texture with a close crumb. Heat 1 cup tap water in the microwave on HIGH for 1 minute. Pour into bread machine pan with the blade in place. When dough cycle has finished and bread has risen to double the original size, remove the dough onto a floured surface. 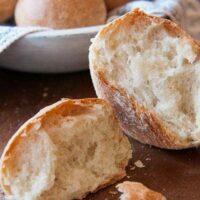 For dinner rolls divide dough in half (2 pieces), then cut each half in half (4 pieces) and finally, divide each of those pieces in half again resulting in 8 rolls. Form into balls. Cover a cookie baking sheet with a silicone baking mat or parchment paper. Lightly scatter cornmeal over the sheet before placing the round dough balls onto the cookie sheet--evenly spaced from each other. Cover dough balls with a tea towel and set in a warm place for about 45 minutes or until risen almost double. Brush rolls with cooled cornstarch glaze. Use a serrated knife to make a small gash in the top, if desired, but it's not required. 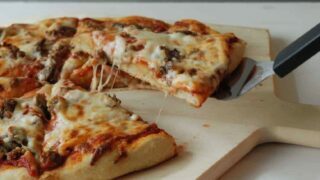 Bake in 375 degree pre-heated oven for 35 minutes until crust is crisp and brown. To my fellow yogurt-makers: For a faux sourdough flavor, try substituting whey drained off yogurt to produce Greek yogurt for the water in this recipe. Can you ever over-proofed these babies?? Because I’ve forgotten to set my timer ? Yes, Ju, you definitely can over-proof. If that is what happened, push the dough down and let it rise again, just not as much. 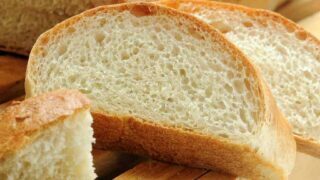 When your bread is over-proofed, it will usually collapse on top and/or the sides. Hope this helps. Thanks Paula. They turned out PERFECT! Family requested to make again ? Glad you liked them SS. I think I agree with you that the font is light when you are typing a comment. Will remedy that ASAP. Thanks for letting me know. I made these for Thanksgiving, with no changes to the recipe. They were a big hit! Easy, and perfect, tender and crusty, as promised. Thank you for these wonderful bread recipes. I’ve only recently started making bread again and love making the dough in the breadmaker and baking in the oven. We were not fans of the bread baked in the breadmaker so this is exactly what I was looking for. These rolls were great! Next time I will use part whole wheat flour or 12-grain. Have you done that before? Our favourite so far is the sunflower oatmeal bread – I skip the sunflowers and substitute Whole Wheat flour for part of the white flour. A very much loved bread here. 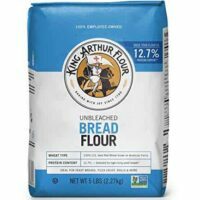 Thank you for making breadmaking so easy!!! I am making these for my mom. Do you have any freezing suggestions? Should I freeze after cooking, freeze before? If freezing before what about the glaze? I would like to make it as easy for her as possible? I am hoping it will be a taste of home (UK) for her. I made these last night. They came out perfect and everyone loved them. Thank you for the recipe. I have been trying out different recipes for crusty rolls, but they never turned out right. Now I will never have to look for one again!!! Thanks Paula for sharing. These rolls were just yummy and the crust on top was just like your picture!!! The cornstarch mixture, as well as the entire recipe was a bomb!!! They are great, no mistakes in measurements! Really nice trick the cornstarch! 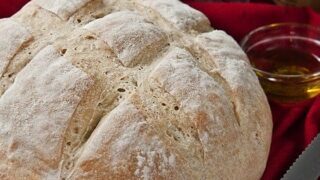 Thanks for adding this recipe in one of my favorites of bread making! Real tasty rolls! Thank you, Paula! We’re going to use them for pulled pork sandwiches tonight. They’re in the oven now and smell amazing! Thank you so much for your recipes. 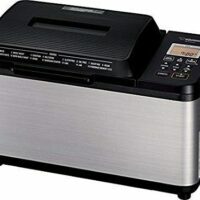 I’m new to bread machines and I’m learning a lot on your site. I made the glaze with 1/4 cup of water and then realized there are no units on it implying it should be 1/4 teaspoon but that doesn’t seem like enough water. Should it be cup or teaspoon? Anyone know? My mistake–which I have corrected. You were right to assume 1/4 CUP of water. 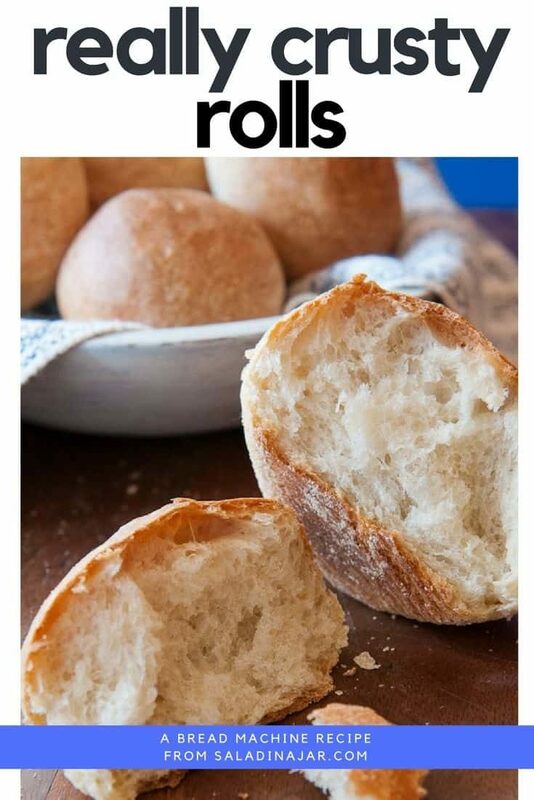 Hope your rolls turn out to your liking. These are great rolls! I made mine by hand using whey in place of the water. In order to get the nice crust, the rolls definitely need close to 35 minutes, which I initially thought would be too long a baking time. Thank you for sharing this recipe. made these tonite. So good. I brushed mine with butter and it only took 20 minutes. I just took these out of the oven. It’s a snow day here and I was looking for a roll to go with the soups (clam chowder and also beef vegetable) I have simmering. Wish I could include a picture but I don’t know if that’s an option. Yes, I took pictures because they are beautiful 🙂 So happy with how they came out!! They look really good, they are crusty on the outside, soft on the inside… and they taste AMAZING. I always come back to your site for bread recipes. Thank you for another fantastic recipe! Thanks for the testimonial Andrea! My bread machine directions say to put in the yeast first,then flour, etc. ending with the liquid. I’ve noticed your recipes, including this one, start with the liquid and end with the yeast. Does it matter which way I put the ingredients in? Thanks for helping out a novice. I made my first loaf of bread using the combined bread machine and oven. It came out great! You ask a very interesting question. I generally say to follow the directions for your particular bread machine as far as the order of ingredients. All of machines have specified the flour, then the yeast last. I can’t imagine doing otherwise if you are using the timer because you don’t want your yeast to get wet. If not using the timer, I can’t imagine why it would matter. Glad your loaf came out good. May you have many more happy bread-making experiences. Yes it matters! You do not want the yeast to get wet initially in a bread machine. I’m also making these today. So far so good 🙂 however I didn’t have cornmeal so I’m doing without. The cornstarch / water slurry is very interesting. Can’t wait to eat these with my soup. I love this blog. Thank you so much for doing this. Nice rolls, and I love the tip on using cornstarch with water who knew? Thanks for sharing these I must try this out soon. Wow! I love bread and this recipe looks easy and tempting! Would be so good with soup but makes me wonder if you have a good bread machine recipe for bread bowls. These look and sound so good! I can’t wait to try them. woo, HOO!! I’m running to the kitchen to start this now! I don’t normally save my whey but just did a batch of yogurt and did! I love the thought of the crusty exterior!!! 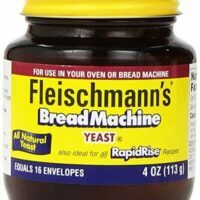 Is the 1 tsp of yeast true? Very excited ! Thank you!! !